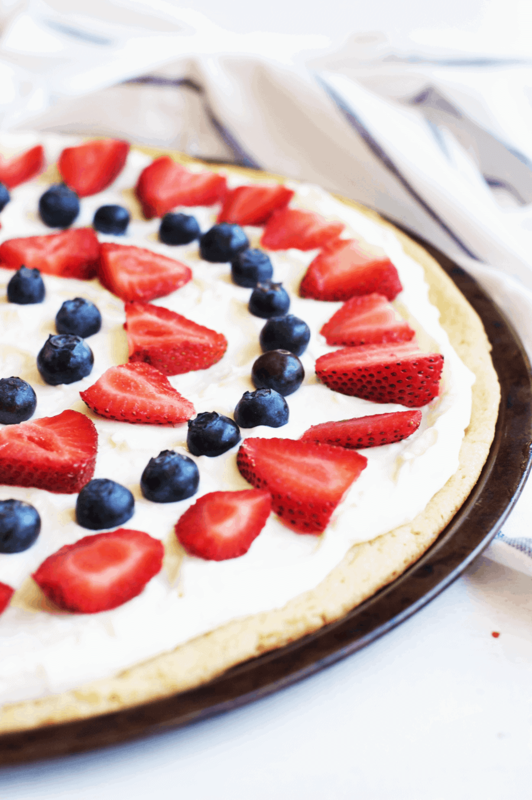 This 4th of July berry dessert pizza needs to be at the top of your list of festive foods to make! The combination of juicy, sweet berries and cream cheese icing spread on a sugar cookie crust is absolutely delicious. You’ll definitely be going back for seconds, maybe even thirds! 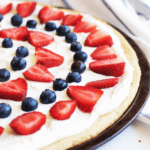 The fun part about this berry dessert pizza? Cut your strawberries so they are each 1/4″ thick. This strawberry slicer works wonders in making sure they are all the same size! I also really like using this strawberry huller to get the stems off clean. I made this dessert so I could use up the overflowing cartons of strawberries in my fridge. We went strawberry picking at a local farm. The deals for ripe, succulent strawberries are unparalleled at a U-pick event, so of course I ended up with 3 pounds! I mean, how can you not? Even after I made strawberry honey butter and jam, there were enough strawberries to decorate this enormous dessert pizza. It was the perfect way to finish them off! 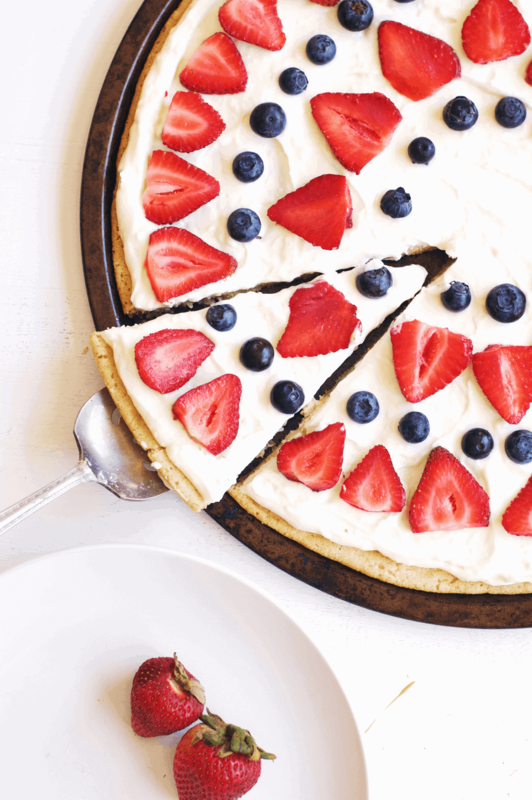 This 4th of July berry dessert pizza is such a simple and festive dessert that anyone can make! Grab the recipe below, and have fun decorating (and eating)! 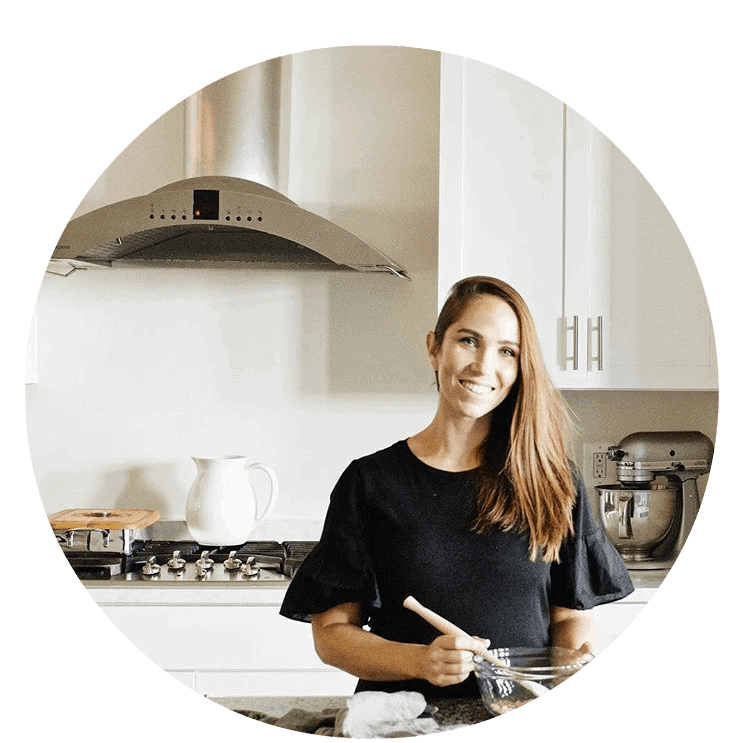 Looking for more fun 4th of July recipes? Try this Red, White, and Blue Ice Cream Float, or these 4th of July S’mores! Make it a happy 4th of Ju-pie (ha!) 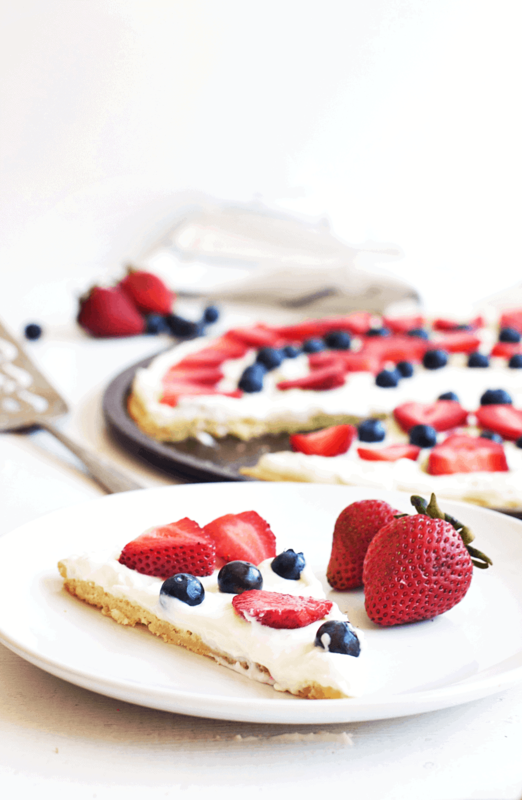 with this festive and delicious berry dessert pizza. Serve it as a treat after a satisfying barbecue meal. Preheat the oven to 350°F. Form the cookie dough into a large ball, then roll out into a flat circle on a pizza pan. It will expand, so make the crust slightly smaller in diameter than your pizza pan. Bake for 12-15 minutes or until the crust turns slightly golden. While the cookie crust is baking, whip the cream cheese for 2-3 minutes on high until it is smooth. In a separate bowl, whip the heavy cream until it becomes stiff and peaks form. Fold the whipped cream into the cream cheese and add in the powdered sugar and lemon zest. Mix well until it's smooth and creamy. Cover and let it chill in the refrigerator. Remove the cookie crust from the oven and let it cool for 15 minutes. You can place it in the refrigerator so it chills quicker. Once it's cool, spread the icing over the entire crust. 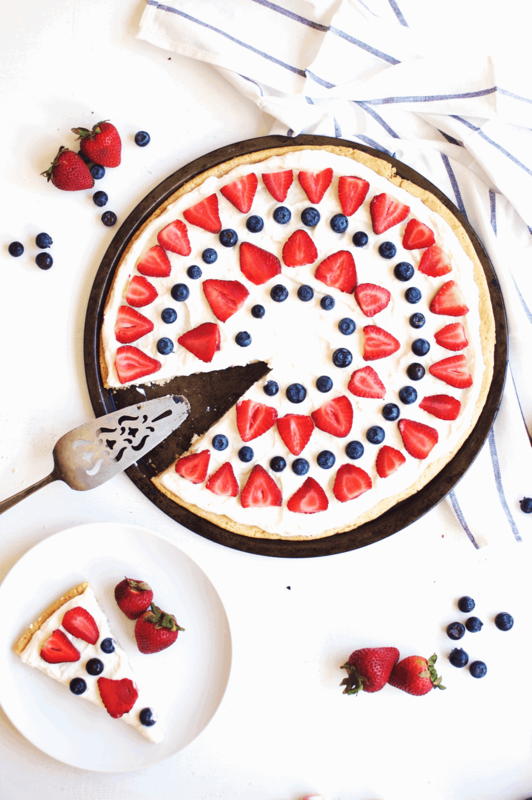 Decorate the pizza with circles of alternating strawberries and blueberries, whatever design you desire. Serve immediately. Cover and save the leftovers in the refrigerator for up to five days. This looks so tasty! Im excited to try it out this weekend!